Location of Fishers in Hamilton County, Indiana. 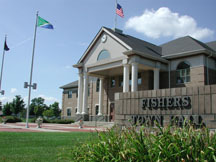 Fishers is a city in the state of Indiana, in the United States. As of the 2010 census, the population was 76,794. This page was last changed on 19 July 2018, at 18:12.